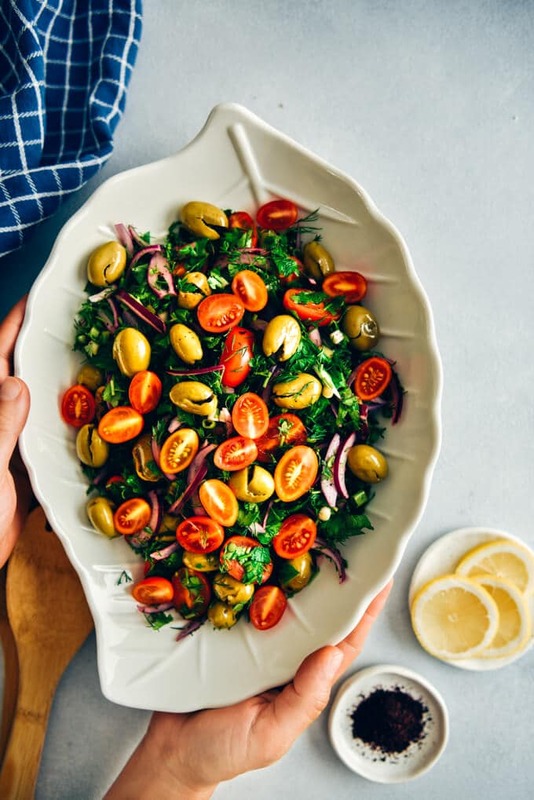 This Green Olive Salad is a summery salad packed with fresh ingredients and Mediterranean flavors. Sumac, pomegranate molasses and lemon juice make it a mouthwateringly tangy salad that is perfect to serve on a party table. It is quite satisfying and makes a wonderful light summer lunch too. This post was originally published in 2009 and we are updating it with new pictures and additional information. Most of you will probably find it weird but we have this green olive salad at breakfast. That’s right, with all those onions! The tartness of the salad helps you wake up. Moreover, it gives you a good appetite and you want to eat more! Luckily, my parents are living in the South of Turkey, where there are huge olive orchards. They always bring brined green olives to us. Mom prepares them herself every summer because she knows well that I have a weakness for the green olives. They make a wonderful snack at any time of the day. I never feel lazy to make this simple green olive salad for a weekend breakfast. Just like any homemade food, green olives taste better when you brine them at home. I wrote a blog post about How To Brine Olives a while ago. It can really help you a lot if you want to brine your own green olives. First of all, remove the pits of green olives to make this healthy olive salad. Secondly, chop the onion and massage with sumac and salt. Then simply chop the tomatoes and herbs and combine everything in a bowl. Besides the summer flavors in it, what makes this salad so good is the simple dressing made with lemon juice, pomegranate molasses and olive oil. Whisk these three and pour it over the salad and stir well. There is an important step when preparing onions for the salad. Dice or slice them as thick or thin as you’d like. Sprinkle a little salt and one teaspoon (or more if you like) sumac on them. Massage them with your hand well. This will remove the bitterness of onions and they will have a nice flavor. If you can’t even tolerate the idea of onions, then leave them out. This Green Olive Salad would still be tasty but I highly recommend that you first give it a try as it is. 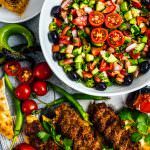 You might have heard about Turkish style breakfast, which includes several sweet and savory dishes served in small portions. As Turkish people, we love to create recipes for breakfast because a slice of a cake like this amazing Marbled Chocolate Banana Bread is never enough for us at breakfast. Therefore, salads like this one definitely brings a great excitement to our weekend mornings. 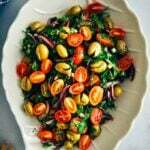 Believe it or not, this green olive salad becomes the star of the table and everyone wants to have more whenever I make it. Turkish Menemen, a simple one-pan dish with eggs, tomatoes and green peppers. Meatless Stuffed Grape Leaves, with lots of olive oil for sure. Turkish Potato Salad with herbs, eggs and onion. Watermelon Feta Mint Salad, a super refreshing salad. Would you eat these in the morning? I’d love to hear your thoughts! Please share your answers in the comments section below. The richer the breakfast table is, the happier the Turkish people get. We love to see all these foods at breakfast. Not to mention various cheeses, breads, jams, honey, butter and nuts. Below is the picture of the original post from 2009 when we started this blog and had no idea about food photography. We don’t want to delete the pictures from our old posts because they remind us how much experience we’ve had since then. A healthy and tangy fresh salad with green olives for a light summer lunch. 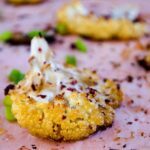 A perfect Mediterranean side dish for dinner parties too. In a medium bowl, combine chopped onion, salt and sumac. Massage them with your hand so that all pieces are coated with salt and sumac. Add in the chopped green onions, tomatoes, parsley and dill. Toss in the green olives. Whisk together the lemon juice, pomegranate molasses and olive oil. Pour it over the salad and stir well. I can eat this any time of the year. Looks gorgeous! I love green olives any time of day! And I am intrigued by your trick of sprinkling the onion with salt and sumac! Thanks for the shout-out for my Lentil Salad with Green Olives. Wish I could come over and cook with you for a day! Hi Kalyn! Green olives make a great snack, aren’t they? I’m sure you will love onions in any salad even more that way. Your lentil salad is definitely my type of salad and it’s on my list to try. You know, my house is always open to you. It would be my pleasure to cook with you! I am totally on the lookout for sumac ! I haven’t been able to find it here yet but will make this salad again once I am able to !! I think I would like this for breakfast. It would take some getting used to though. Never tried olives in this way for breakfast. I used to include olives in sandwich or in burger only. Really wonder. A good trial. I wish to add cooked macroni along with it!! I love savory things for breakfast. I bet this really wakes you up! That is a tasty looking salad! I often enjoy having savoury salads for breakfast! It is really cold here where I live, and for breakfast I am having oatmeal and a cup of tea in front of the computer. Then I saw this picture of green olives salad and my mouth is watering. I have to have it for lunch today. Thank you for your recipes, I am glad my husband doesn’t know about your blog, if he ever does, he will ask me to cook every single one of your recipes, especially the main dishes. I love olives, and I LOVE salad for Breakfast. It does sound crazy, but it’s fun and delicious to start your day with something green. I have some pomegranate molasses but I really need to try and find some sumac. I’ve seen so many references to it lately, I really am going to have to get some and try it (maybe starting with this salad!). I’ve never had fresh olives. This sounds great! This sounds delicious! But I’m most intrigued by the concepts of breakfast that different cultures hold. I’ve seen typical Malaysian breakfast dishes appear as lunch or dinner items on American menus because the components align more closely to those meal times. I should try something like this for breakfast, just to change things up! MMMM…this salas is healthy & looks so good to eat at lunch! But as breakfast?!? The most important thing is: that you love it!! Olives and pomegranate molasses sound like an inspired combination, can’t want to try it! 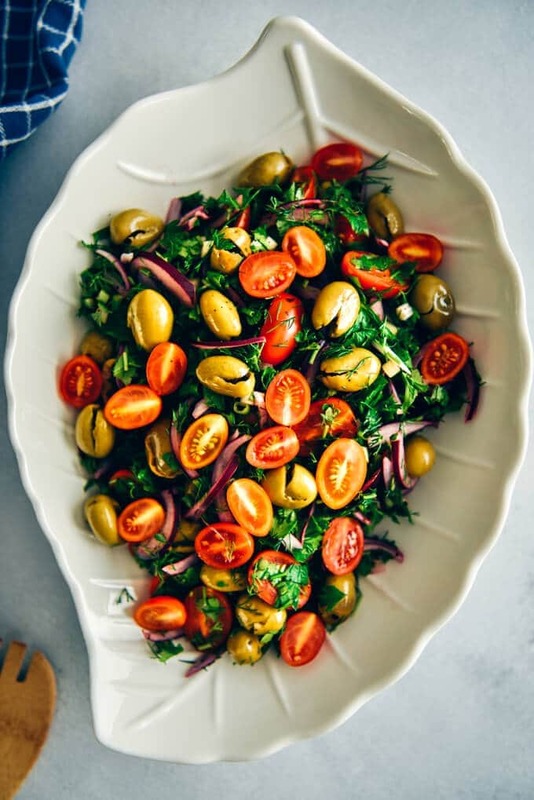 I will forward this recipe to my dad – he would love this salad anytime a day as he is a big fan of olives. Yummy!